Lamb Report: Well, it's been a rather exciting 24 hours sheep-wise on the farm. After we spent a couple of crazy hours working them (this involves catching up 50 sheep that in no way want to be caught up), we opened the barn gate and declared the start of Sheep Freedom Day 2006. Woohoo! There was plenty of leaping and jumping for joy and devouring of the bright green grass. Bruisie got so excited she went back in the barn and had a baby girl. For a first time mother only one year old (another surprise pregnancy), she did great. We did have a little trouble with some of the mommy hormones kicking in (like the milking ones), as all Bruisie wanted to do was lick that baby clean--and she spent all night doing it. This is the softest lamb I have ever felt in my life. Meanwhile, baby was having trouble getting up on those long back legs, but after assistance with the milk bar this morning, she was not only up and walking on her own, but after a few minutes I swear she was dancing to the Sunday Morning Blues on the radio. Then, as you can see, it was time for a rest. Current Lamb Count: 17. Number of surprise guests in Bruisie's bonding suite last night: 1. (Click here to see who it was.) Number of ecstatic participants in Sheep Freedom Day 2006: 50. Number of sheep wondering why Sheep Freedom Day Two has them confined in a tiny (but very lush) pen attached to the barn (because we'll be off farm again today): 0 at the moment, 50 once they mow down all the grass in a few hours. look at her beautiful spots! how lovely...i can't believe you have so many! Wow. What beautiful coloring on that baby. How wonderful to experience what you see everyday. Thank goodness they're motherly to their unexpected offspring. Gosh, what a dizzying load of work you have, mothering all those mothers. Well done. Sheep Freedom Day! Congratulations. Hard-earned. What's playing on the radio: "Life's Been Good"? Awww! I love the shots of them teetering on those big long legs. It's amazing to me that they can stand up so quickly! Bruisie's baby is such a cutie! 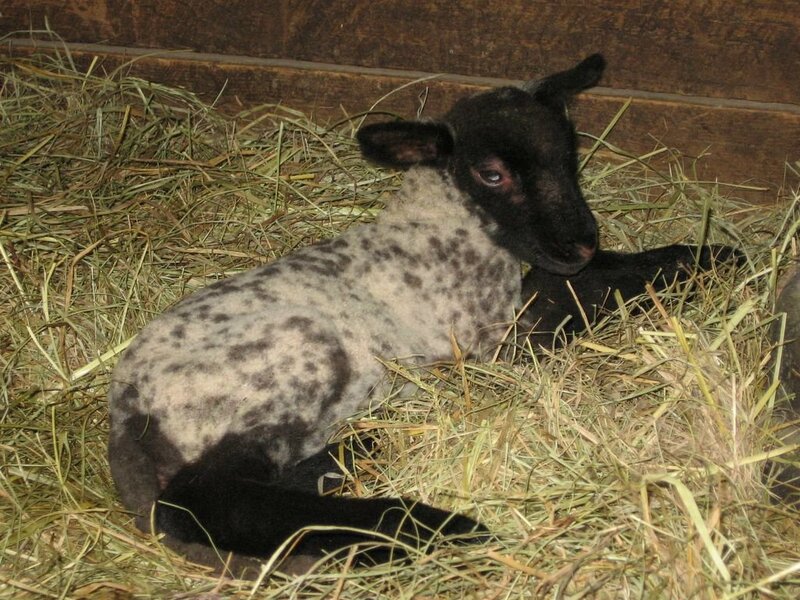 I love those chocolate chip lambs! This is the cutest one yet! Viva La Sheep and Lambs!!! oooh my goodness what an adorable baby lamb! I would love to give Mom and Baby a big hug. I can't wait to start out my day by logging in to Farmgirl to see all the beautiful and sometimes very funny happenings -- it's a lovely alternative to news. Thanks so much for sharing with us. What a cute little lambkin! Here's to show my ignorance. 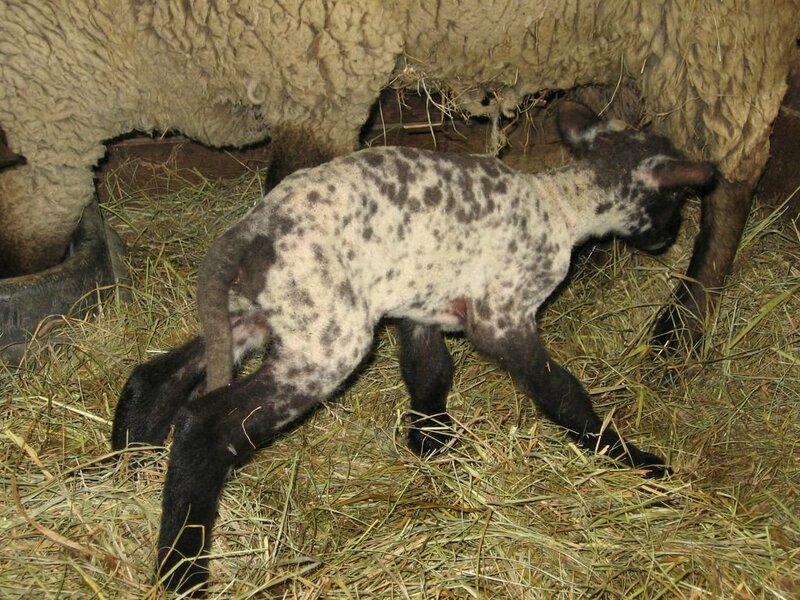 I didn't know that lambs could be spotted like that! Just wanted to let you know that Blogger is giving me fits this morning, and I haven't been able to post anything. Hopefully it'll sort itself out later today. Even leaving this comment has been a challenge. Re trouble leaving comments (as per Jeph's question the other day): I use IE and haven't had any trouble until now (but obviously blogger has gone crackerdog today). Jeph: you (and anybody else having problems with the word verification) might try clearing out your browser--or whatever the technical term is when you delete all the cookies and temporary Internet files from your hard drive. That may help. Oh it's a riot when they jump for joy. I learned about this while reading a wonderful book, Sheep, Stars, & Solitude, when I first acquired my flock. It takes you on the herding journey of a huge flock of sheep across hundreds of miles in the West back in the 1950s. Anyway, at one point the sheep had to cross this scary, rickety suspension bridge single file. There is a photo of them pushing their way across the bridge and then literally leaping into the air with glee once they were off it. Too wonderful for words. Yes, we don't like to breed our ewe lambs until they are 1 1/2 years old, but some of them physically mature quickly, and, well. . . Usually they're pretty good mothers, but you can definitely tell that they aren't as mentally grown up as the others. I mean, they're pregnant at 6 months of age. Now this is normally what sheep raisers do, as you are basically "wasting" a year otherwise, but personally I'd rather wait. This latest one is proving to be a real challenge. Yes, everyone had a blast on Sheep Freedom Day. It really is amazing that (for the most part) within literally minutes of being born they are up and wobbling around and looking for lunch. Yes, yes, yes! And you were right about those clouds--we finally got some rain!